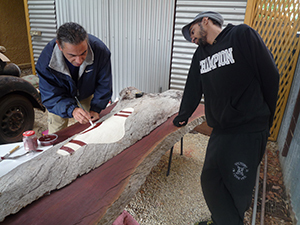 Many things happen ‘behind the scenes’ in designing and making Kaurna Cultural Markers. 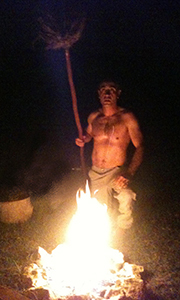 As is also the case in bringing them to life through ceremony and celebration. 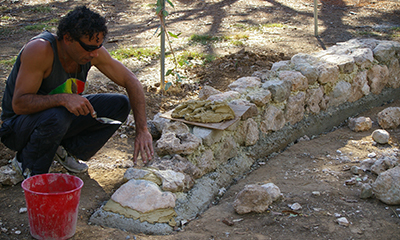 Attention is given to the source of materials, as the use of natural materials in projects acknowledging Aboriginal cultures requires consideration as to the cultural meaning of the materials and the locations from which they are obtained to ensure that the materials are appropriate to the new site and the cultural interpretation or recognition being undertaken. 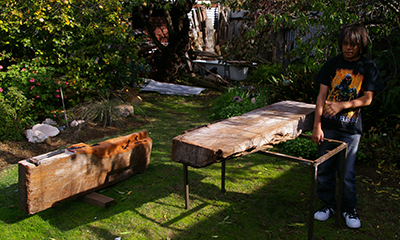 We use natural materials from Kaurna Yerta (Country) whenever possible. 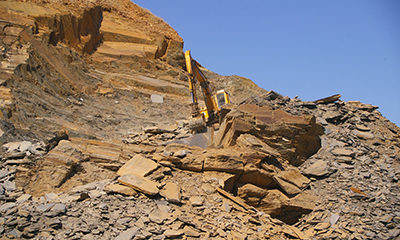 Quarries, forests and other sources are visited and working relationships established with the operators. We sometimes have unusual requests. Specialist fabricators are required for some components of the Markers but we construct as much as we can ourselves. 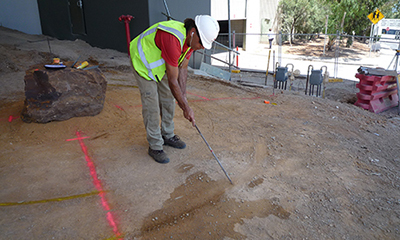 This way ceremony can be conducted with some artefacts before installation and other Kaurna people can be included in the making process whenever possible. 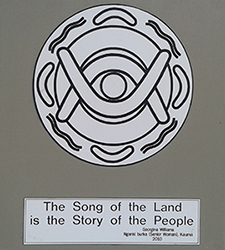 In particular the younger generation are included to encourage ‘ownership’ of the Markers by them and provide cultural practise through engaging with cultural space whilst listening, learning and feeling place their identity. 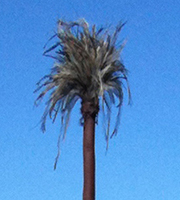 Cultural markers are dedicated bi-culturally. 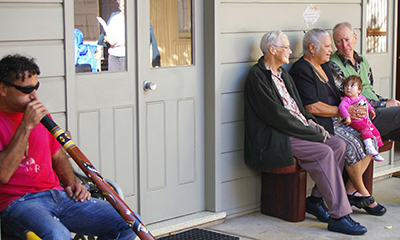 At Pennington Gardens Reserve the Tjrin Tjrins and Marka Kokallokalla are acknowledged through both cultural traditions. 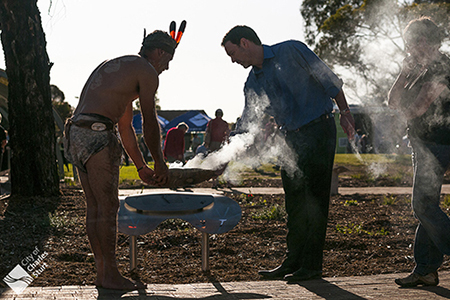 Karl and Mark Withers, CEO, City of Charles Sturt, using breath to bring fire of life. 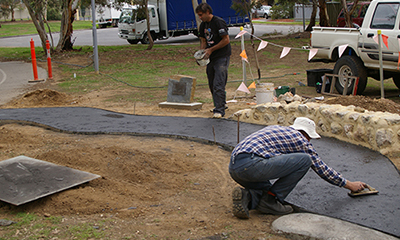 Telling the story of Kaurna Meyunna complements and supports any public space recognition. After some years work, a 104 page, 45,000 word cultural mapping report was presented to Council on the 2nd of August, 2013. 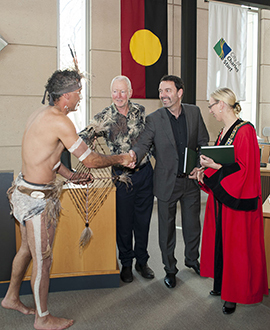 The presentation included ceremony to acknowledge the handing over and sharing of Kaurna cultural information and history with Council and its residents. 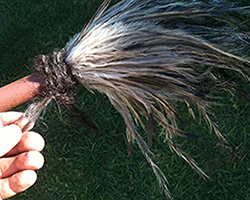 The report provides the content for Council’s Kaurna Culture Web Pages and underpins other recognition and inclusion projects within Council. 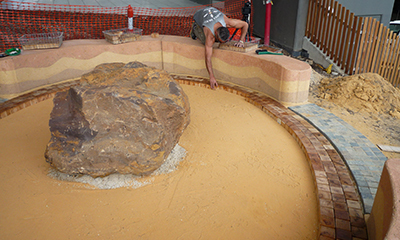 Narno Native Pine (South Australian species Callitris gracilis/preissii) is being used for timber block paving around Paintyappendi Pure/Contemplation, Feeling Stone. It provides a contemplative timber to go with the contemplative stone. 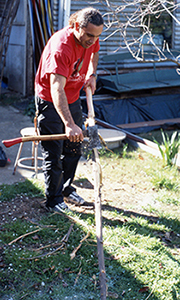 Narno is a timber traditionally used by Kaurna and other Aboriginal people for a variety of practical and ceremonial purposes. 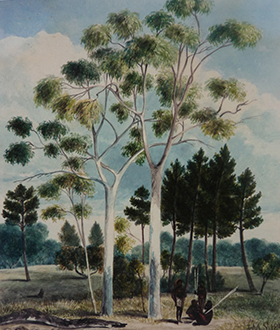 Narno was extensive in Kaurna Yerta at the time of settlement with two forest areas being known as the Pinery by the European settlers, one in the Enfield region, the other in the Grange/Royal Park region. 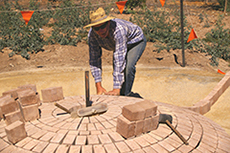 Timber block paving is an old technique, mainly using Redgum and Jarrah for streets, stables, workshops etc. in the 19th Century but has pretty well disappeared now. 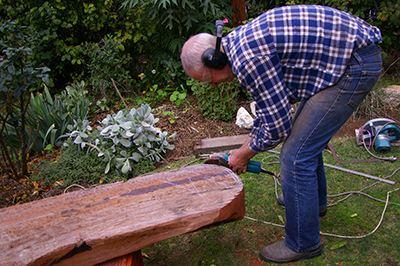 Redgum was used in Adelaide, Melbourne and Sydney and Jarrah was also used in London and Berlin. The old stables at the Carrick Hill property still have Redgum block paving. 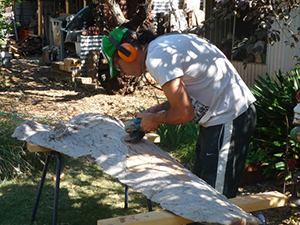 Narno timber is white ant and wood rot resistant and used for various construction purposes including ‘pug and pine’ buildings. It is also a very good burning timber with a distinctive aroma. 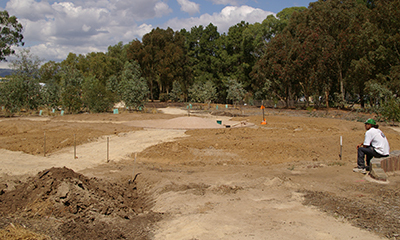 Narno has now almost disappeared from the Adelaide Plains, the last significant stand being lost in the 1960s during further development at the Grange Golf Club. 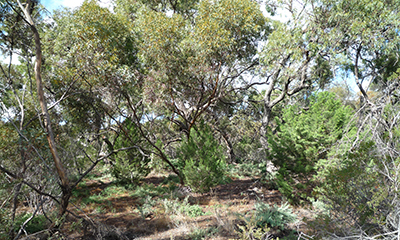 There are a few remnant trees there, as well as in the Folland Park Native Bushland Reserve and of all places, the West Terrace Cemetery. 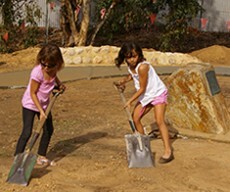 It is being replanted in areas such as the Adelaide Parklands. 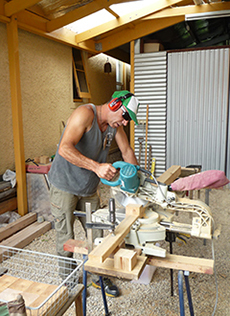 Commercially milled Native Pine timber is no longer produced in South Australia so our timber (Callitris columellaris; known as White, Northern or Murray Cypress Pine) is being sourced from managed regrowth in State Forests in western New South Wales as well as south-western Queensland, the Country of the Wiradjuri, Kamilaroi, Barunggam and Mandandanji language groups. 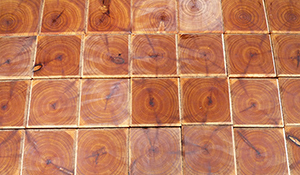 We are pleased to be able to obtain the timber from there. 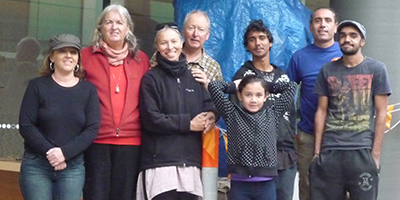 The Quakers wished to acknowledge Kaurna Meyunna and Kaurna Yerta at their Meeting House, North Adelaide. 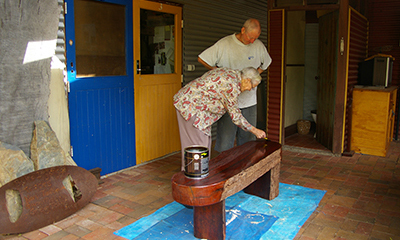 A Karra/River Redgum seat was made involving three generations of Nungas (Aboriginal) and Goonyas (non-Aboriginal), working together. 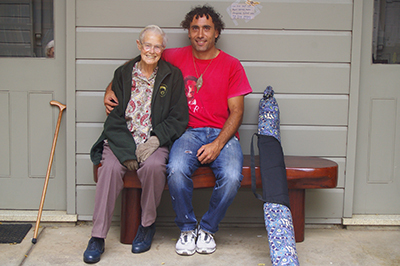 The Karra is from Yankalilla, Kaurna Yerta. 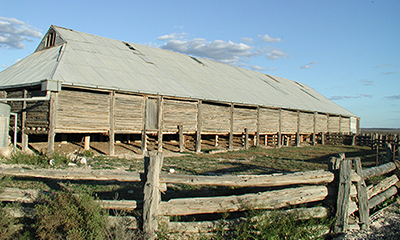 The Meeting House, c1840, is one of the oldest settlement buildings in Adelaide, a prefabricated Manning House. 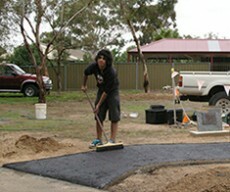 Karl & Gavin at work constructing Tikkapirendi. 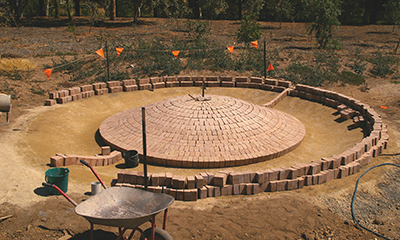 The mound form was hand constructed by us and the bricks made to our specification by BSMART Bricks. 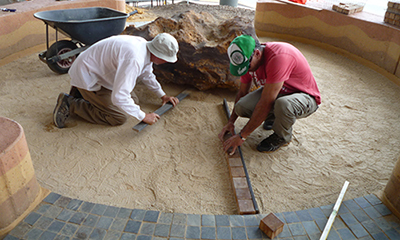 A special batch was manufactured and the bricks were then cut in half to reveal the internal aggregate giving the brick a terrazzo like appearance. 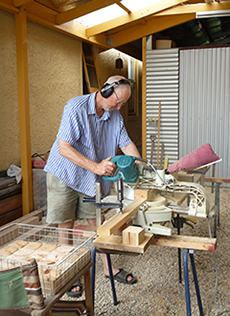 Brick making by BSMART at Lochiel Park. 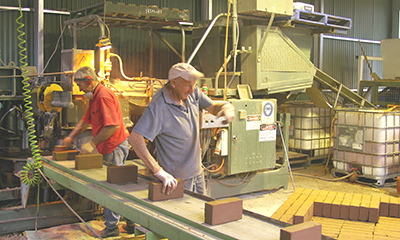 BSMART bricks are a unique product, utilising construction and demolition rubble diverted from landfill as a fine aggregate mixed with the clay and a small amount of cement, to create a more environmentally friendly product. 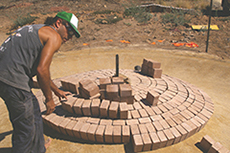 BSMART bricks are not fired, they are compressed, therefore utilizing far less fossil fuel based energy. 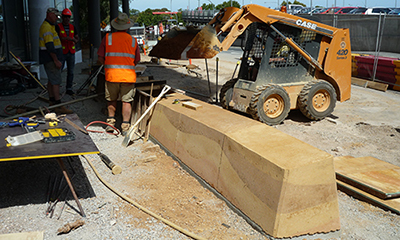 Being manufactured on site there is also a significant reduction in energy for transportation required. 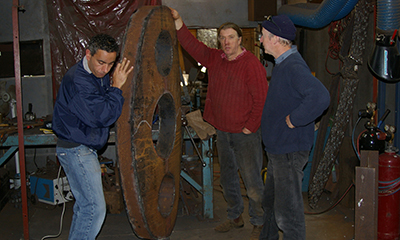 Karl, Greg & Gavin at Greg’s workshop making decisions on the detailing of Waiawaiandi. 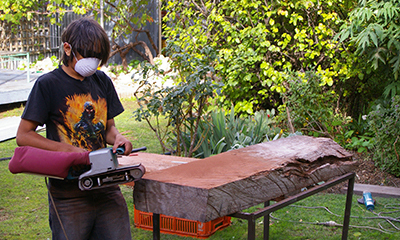 Making public space sculptural objects to symbolically represent Kaurna culture is a new process and requires careful cultural and sculptural consideration. 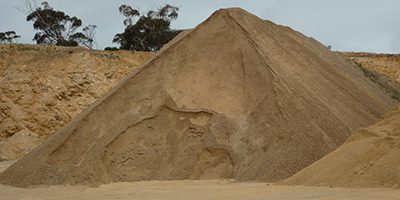 Bangor Quarry, Willunga: source for stone used in Murrendi. 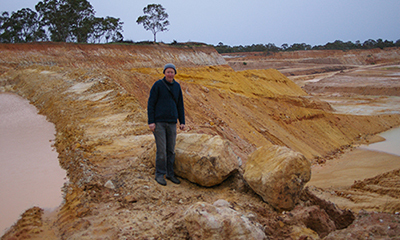 We worked with Bill Lock, the quarry operator. 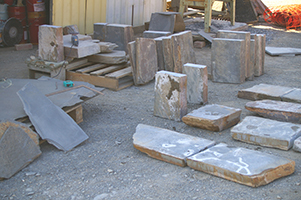 He put aside specific stone as it was uncovered in the quarry operations. 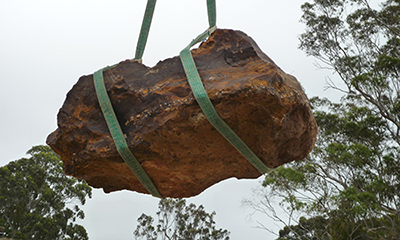 The stone was then worked at the quarry to achieve the amount and size of stone required for Murrendi.